Virtual World Games With Horses Article - Virtual Worlds Land! Rate this Article Horse racing and breeding has found itself into virtual worlds as well. Virtual horses are fast becoming a trend with the netizens of this digital age. You can find a lot of games incorporating virtual horse breeding and racing! While there are games that are dedicated specifically for this kind of activity, there are virtual worlds that have decided to add this aspect to their already diverse sets of activities. To simplify your search, here are three virtual worlds that have incorporated horse racing and breeding as one of the things that you can roleplay when you sign up for an account. First and foremost, we have IMVU. This game has gained a lot of popularity because of the openness of the world that it offers its users. Thousands of people are online at any hour of the day, and coming from all over the world. People come here because of the chance to be themselves, without having to be constrained by the realities of where they live, and to express their own quirks without having to worry about what the other users will think. Aside from giving you a penthouse for private chatting, thousands of virtual bars to hang out in with other players, IMVU also allows you to socialize with other players by giving you your own horse. You’ll have to buy it with in-game credits, but once you have your horse, it’s yours to ride as long as you’re active in the virtual world. You can fully customize this horse too! To meet fellow horse enthusiasts, you can simply just search for chat rooms dedicated especially for that interest. You can talk with fellow horse riders, arrange rides out in the virtual world or just simply hang out. Of course, who could forget about Second Life? This award-winning virtual world has almost everything there is to emulate an actual world. Of course, with horses being popular amongst virtual world enthusiasts, it’s only natural that the developers of this excellent virtual world will opt to include horses among the pets that their players can purchase and breed. Horses are available for purchase at the Second Life marketplace. You’ll be surprised to find out that there are companies within the virtual world itself that deals with breeding and rearing up excellent stock horses that you could purchase using Second Life credits. Be amazed at the number of options that you have when choosing your own horse for use in the virtual world, because there are simply a lot here. Aside from horses, you can also adopt other animals as pets. If you’re a pet lover, you’ll certainly enjoy the immersive experience that this virtual world offers you. Roblox, the voxel-based virtual world that bears testimony to the saying, “Sky is the limit,” is not to be outdone. 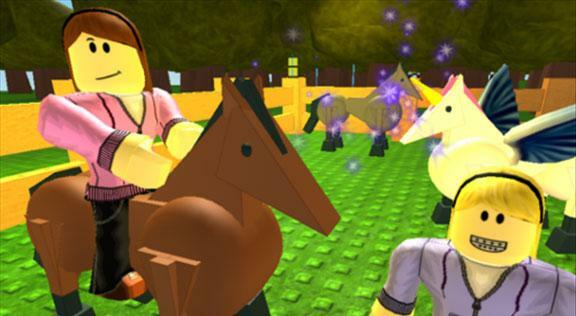 Because the games and worlds within the Roblox universe is created by the users themselves, it won’t be a surprise that horses and horse racing games form a big part of the offerings of this virtual world. There are plenty of horse racing games within the Roblox universe. One is aptly named, “Horseback Riding,” developed by a user going by the handle “ratchel,” wherein he or she teaches Roblox gamers how to ride a horse. The in-world game is designed with enough facilities for people not only to learn how to ride horses, but also to practice in preparation for future races in other games. It’s wonderful how people have accepted horse breeding and racing as one of the more enjoyable activities in virtual worlds. Give horse breeding and racing a try with any one of these three virtual worlds!